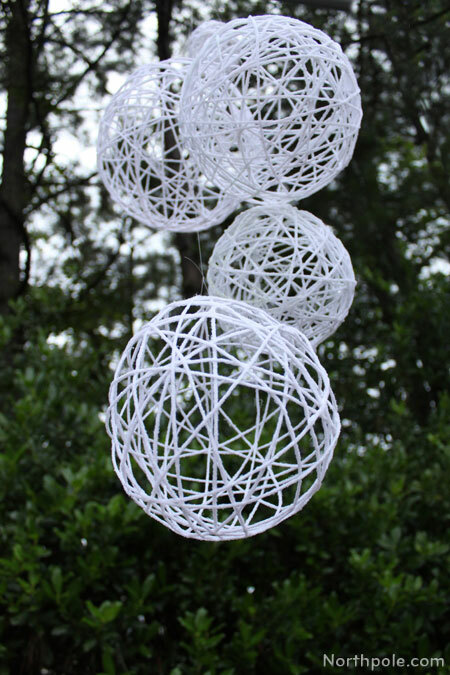 These large, airy, decorative orbs are made from stiffened yarn and would look pretty when hung from the ceiling in your entryway or living room. 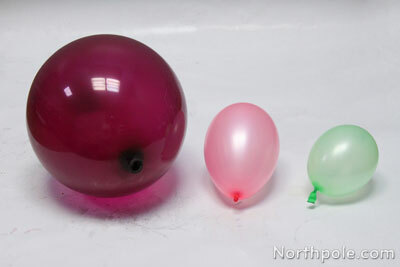 You can make big orbs using regular balloons, or you can use water balloons to make smaller orbs. No matter what size balloon you select, be careful not to blow the balloon too full of air, or you will end up with a pear-shaped orb. Read on for more details on how to make your own lovely yarn orbs. *The Elmer’s glue leaves a frosty look on the yarn after it dries, which is not ideal for darker colored yarns (such as red). We tried it with both white and silver yarn, and liked the results of each. Cover work area with scrap paper. Blow up the balloon to desired size, and set aside. 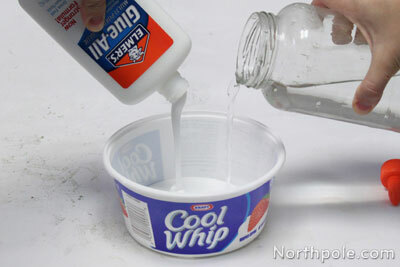 In a bowl, mix 3 parts glue with 1 part water. We just eyeballed it, using just a little water. You want to thin out the glue enough to be workable, but not too runny. If you add too much water, the orb will be flimsy when it dries. Cut a long, long piece of yarn and place in the water/glue mixture. Make sure the yarn is fully saturated, and then begin wrapping the yarn around the balloon. To begin wrapping it around the balloon, hold the end of the yarn with the neck of the balloon. Then continue to wrap the yarn around the balloon. Note: We held the balloon in one hand and wrapped with the other. 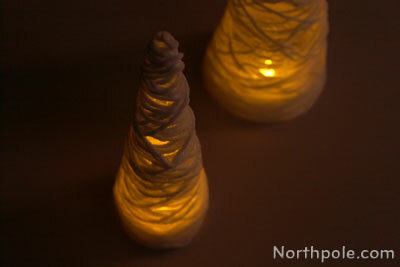 As you pulled a length of yarn from the bowl, squeeze out excess glue using your thumb and forefinger. To finish, tuck the end of yarn around and under another piece of the yarn. We added just a little bit more glue (undiluted) over the end, just to be sure it stays in place. Note: If you run out of yarn, don’t fret. Simply tuck the end under (as directed above), cut a new piece of yarn, wet with glue/water mix, wrap the new end under another piece of yarn, and continue wrapping. Note: We recommend that you hang the balloon to dry, or lay it on a piece of wax paper or plastic wrap. Just don’t set it on the newspaper, or you’ll have newspaper stuck on the orb! 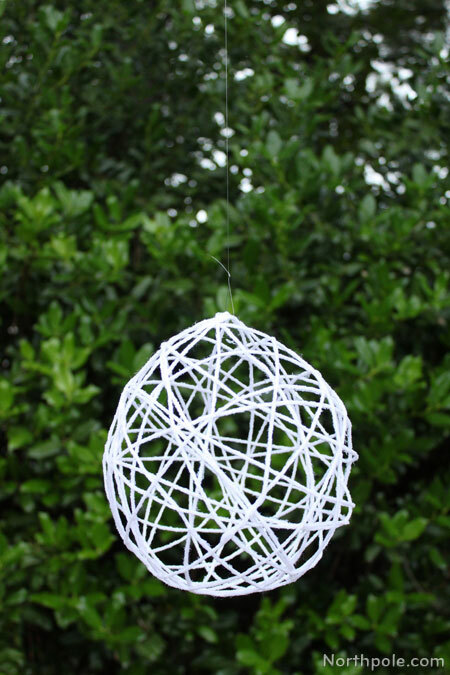 To hang, just tie a piece of string and display it where ever you like! If your balloon is dripping water/glue when you hang it to dry, you might have used too much water. 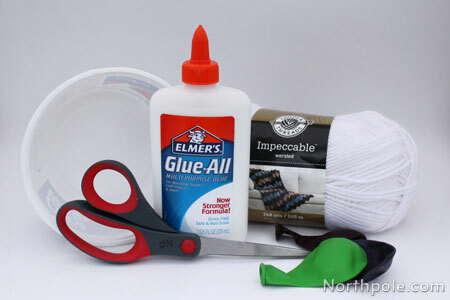 You could unwrap the yarn, squeeze out excess liquid, and recoat with undiluted glue. 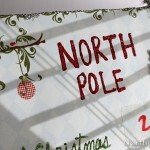 OR wait until it dries (overnight) and apply undiluted glue with a paintbrush. 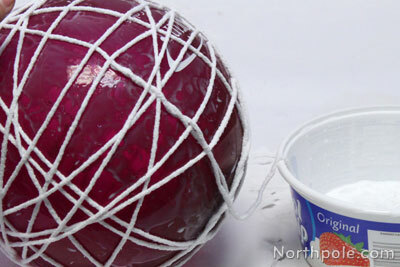 If your orb is not firm after it is completely dry, your glue/water mixture probably had too much water. To correct it, take a paint brush and apply glue directly on the orb BEFORE popping the balloon. Allow it to dry and check how rigid the yarn is. To make sparkly orbs, use sparkly yarn or add some glitter into the water/glue mixture. Cover a foam cone with plastic wrap (or foil) to make trees. Turn them into a table centerpiece by using flameless candles.